I have been carrying this piece around in my bag for a very long time. I finished the last few stitches and tied all the ends together. 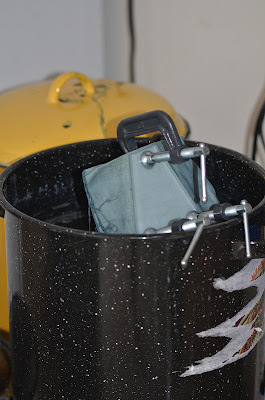 Tomorrow I will mix up a small batch of soda ash, dye and print paste. So much for having the dyes put away for winter. 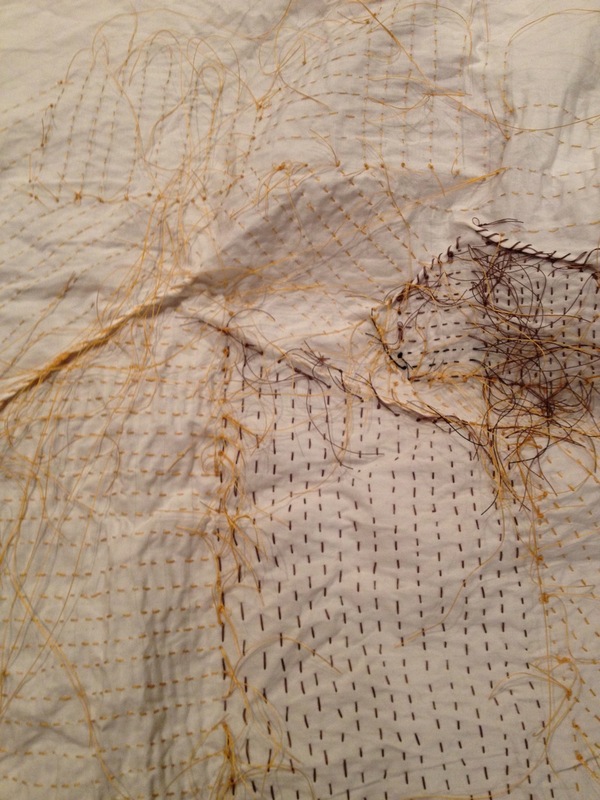 Fun Friday night find for you: a video of Merill Comeau working on her piece. 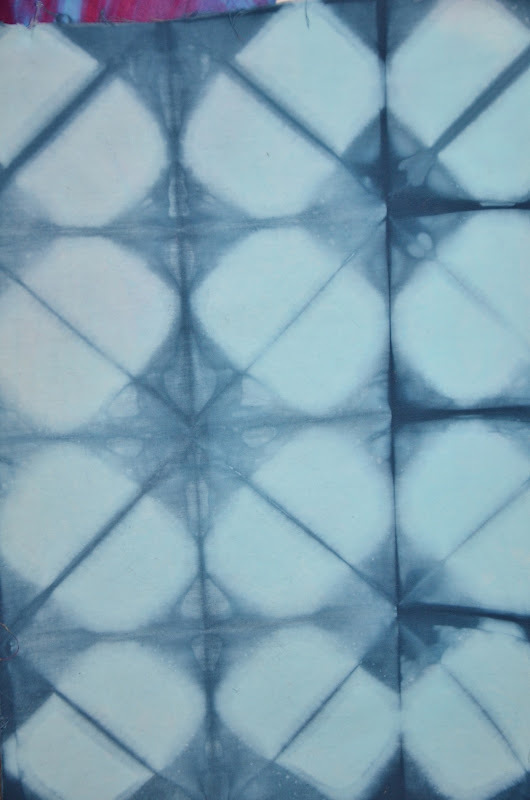 This entry was posted in shibori, surface design on November 9, 2012 by Colleen Kole. I am home after spending last week at the Crow Barn. I took a class with the lovely Elin Noble called Additions and Subtractions. We moved quickly and were able to spend extra time with some additional things not originally scheduled. We covered three different types of dyes: Procion Mx dyes, acid dyes and vat dyes. 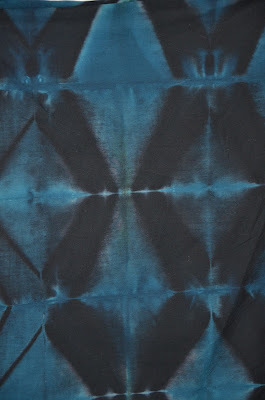 And I learned a bundle of techniques: shibori stitching and pole wrapping, clamping, discharge with thiox, using a pleater and also how to mix and make all the solutions. Just writing this makes me a little tired! We were busy as always and Elin kept the day packed with lecture and then trials of all the principles. Sorry this picture is so dark as I didn’t turn the lights on to take it. I need to process some others I took later in the week. Elin was another fantastic teacher -kind, extremely knowledgeable about dyes and surface design and just plain fun to be around. I had way too much fun! More results coming up this week. This entry was posted in fabric dyeing, surface design, workshops on May 14, 2012 by Colleen Kole. I know, I know I am supposed to be buckling down and doing the work with new focus. I am still machine quilting so that does indeed count. I am continuing with my little mini master’s art degree as planned this year. Scheduled next week starting Sunday is a class at the Barn taught by Elin Noble. I have been busy gathering supplies in between machine quilting. And getting a little nervous and very excited. I have always admired Elin’s work so I am sure it will be a great adventure. I also had signed up for the Sets and Variables # 3 at the Barn taught by Nancy Crow in October. After this, my money tree fund is all gone. I am also realizing that the next class or the next technique learned doesn’t get the work done. You have to do it yourself. 🙂 I love all these life lessons. Geez. Fun though. 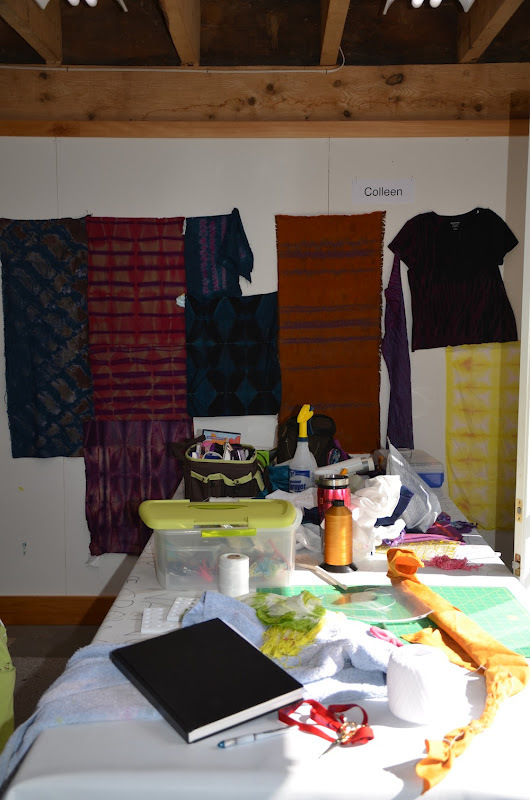 This entry was posted in process of becoming an artist, surface design, workshops on May 1, 2012 by Colleen Kole. Clamping and folding in the indigo pot. Nice to be able to come back to it and know how to “revive” it and work on new pieces. 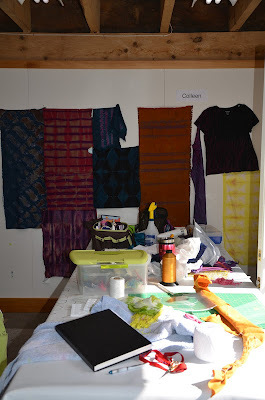 Taking inventory and setting up the dye studio. Fabric has been ordered to dye but way too cold here yet! Some indigo photos. I love how when you take it out of the dyepot, it is this deep blue green color. And then with air contact , it oxidizes right before your eyes. I really love watching it happen. The little moons need a special piece. Maybe some hand stitching. 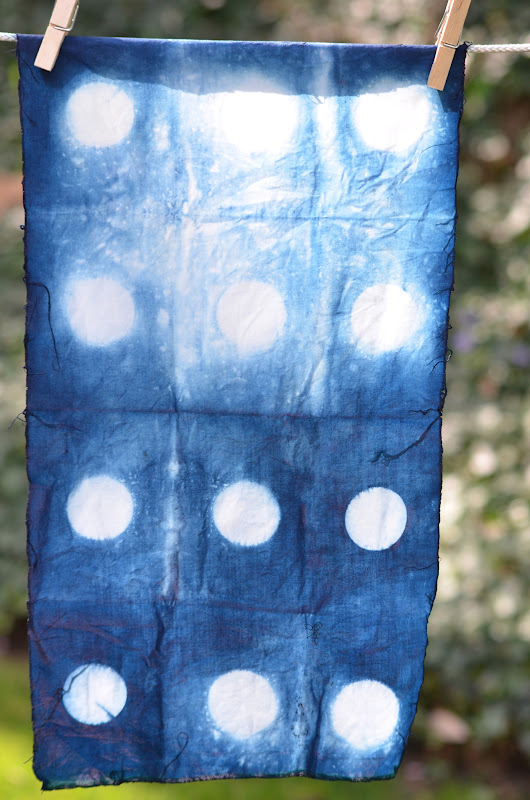 Linen accepts the dye so beautifully. I had bought a bolt of it years ago when a shop went out of business and sadly this is the last piece I had. Does anyone have a source for ordering linen for purposes of dyeing? 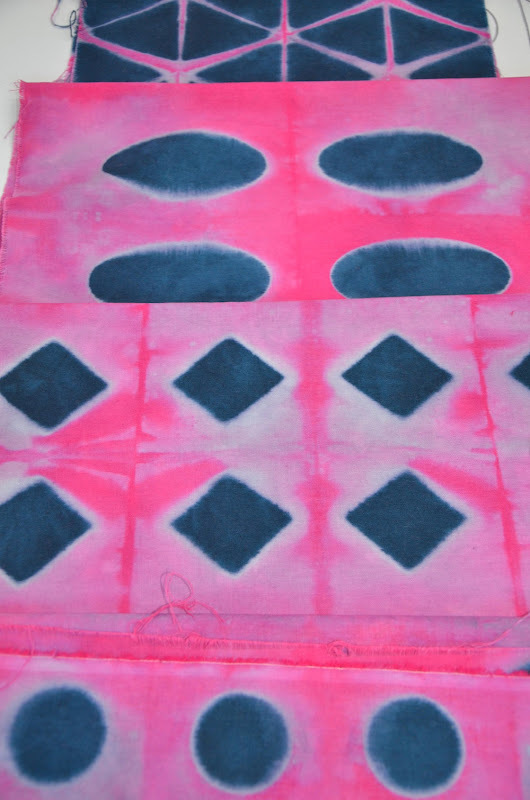 This entry was posted in fabric dyeing, indigo, surface design on April 27, 2012 by Colleen Kole. I spent the last two days at a workshop sponsored by our West Michigan Quilt Guild. We bring in a teacher every two months and this month we had the real treat of hosting Lyric Kinard. I remember mentioning this in my last post and someone commented that Lyric is just lovely and that is exactly how I would describe her. I took the first class which was Surface Design sampler platter: thermofax printing, using textile paints with carved erasers , citrosolve photo transfers onto fabric, using grey gel and foil, wonder under and foil, wonder under and ….many techniques to create a small journal cover. Lyric starting out the day with a carved eraser stamping demonstration. It definitely was a taste of the various techniques and I made lots of little samples to remember them. The next day was the” Bead It Like You Mean It “class. She has a new DVD out about various beading techniques which I purchased but didn’t watch yet. I really appreciated how she uses a small camera to display the beading demonstrations. She had a beautiful box of cabochons to attach with beading. Oh so pretty . She also gave a marvelous lecture on the elements of art and it passed by so quickly with all the beautiful quilts she used to illustrate her lecture. I really appreciated her calm professionalism and her absolutely wonderful teaching demeanor. I walked away calm and confident to try new things and use all of her beading techniques. So it was a treat and a privilege. Lyric was lovely and no wonder she was awarded 2011 Teacher of the Year by the Professional Quilter Magazine. This entry was posted in Lyric Kinard, surface design, workshops on March 29, 2012 by Colleen Kole. I was really tired for a few days after I had finished my class work. The adrenaline must be wearing off. I kept going though and have weeded through my work basket and purged a few projects that really never need to be finished. They truly were just experiments or class exercises. That was a good feeling. My studio was all sparkly clean on Saturday and ready to go. 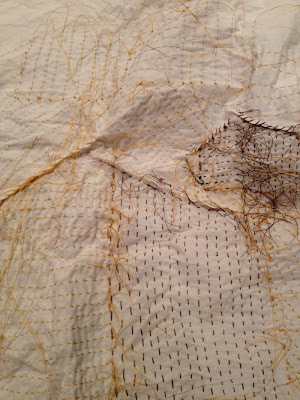 I am machine quilting an oldie deemed worthy of finishing and hope to have it finished in a few days. I also started a 1-2-3 lime fructose indigo vat. I love blue. I know -what am I doing now? After a long weekend of pondering what to do with my current class schedule, I decided to proceed as I scheduled. And paid for. 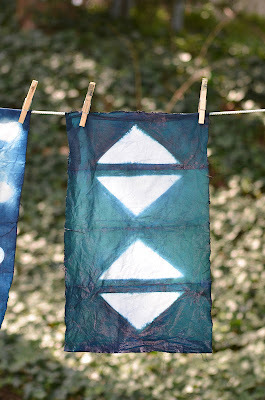 I had joined in on the on line class of dyeing indigo with Glennis Dolce before Christmas. I may not fully participate and save some of the info for summer. But as I was mixing it up tonight, I realized that I really missed my little Rooflines motif the past few days. And figuring out that I missed what had been working on just was even more confirmation that working in a series is what I want to do. And then I wasn’t a bit tired anymore. Just ready to go back to work. I won’t stop with surface design work but will contain it. How would you like to go to school here? What a beautiful video of a beautiful place! Enjoy and dream. 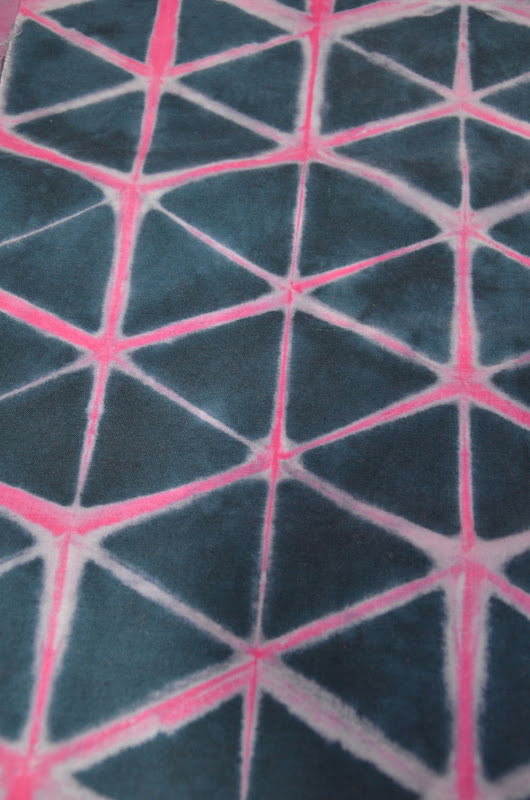 This entry was posted in surface design on March 7, 2012 by Colleen Kole.